Barmouth is ideally situated on Route 8. The Mawddach Trail from Barmouth to Dolgellau alongside the estuary is one of the most spectacular rides in Wales, with wonderful open views north to the wooded hills rising 1000 ft up from the water's edge. This 10-mile section of Lon Las Cymru starts with a crossing of Barmouth bridge and follows the old railway track into the heart of Dolgellau. An iconic feature of the town is Barmouth Bridge, the 136 year–old railway viaduct across the Mawddach Estuary. It is half a mile in length with a wooden promenade suitable for pedestrians or cyclists which now forms part of the Wales Coast Path and the Lon Las Cymru Cycle Network. Morfa Mawddach railway halt is situated at the other side of the bridge, for legs too tired to walk back! 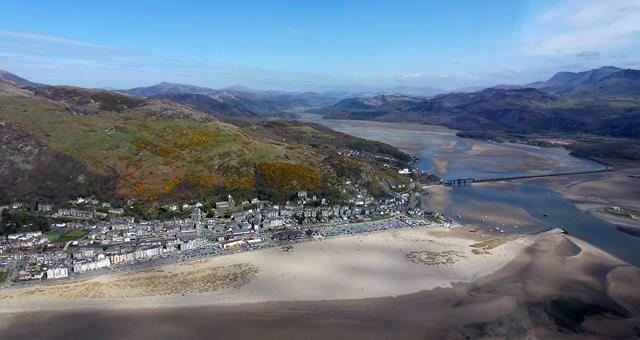 Barmouth developed on the back of the shipbuilding industry and flourished into a popular seaside resort. Its lovely sandy beaches and stunning Snowdonia backdrop have continued to make is a popular holiday destination since the Victorian era. Amongst the notable buildings in the town are the medieval Ty Gwyn tower house and the nineteenth century Ty Crwn roundhouse prison. Another building in the centre of town which has shot to fame - or infamy - in recent years is the 'Arousal Café'. Originally named Carousel Café, the letter C was stolen soon after the sign was put up. The owner has regularly attempted to replace the C letter, only to find it missing again the following day. At the time of writing, he has ceased trying to reinstate the 'C'.